It started as a way for an 8-year-old girl to keep up with her big brother. Sam Gordon just wanted to run with the older kids. The coaches in the local tackle football league figured, hey, why not? Maybe they could turn it into a drill: Who can outrun Max's little sister? They were shocked to find the answer: no one. 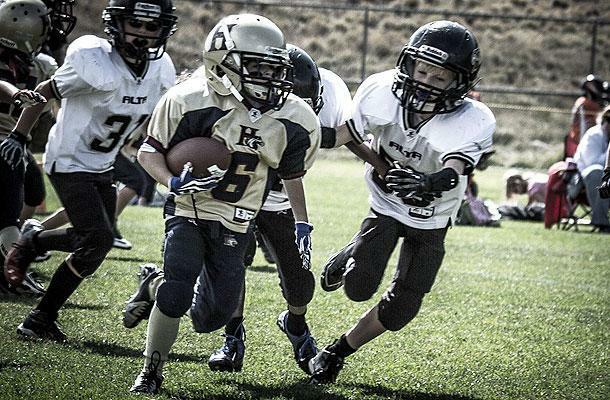 Sam Gordon, now 9, became one of the fastest kids this Salt Lake City area "Gremlins" league had ever seen. They put her in drills and she outran boys two years older. They allowed her into the "Sharks and Minnows" game and stared in awe at not only at her speed, but her ability to move like a tailback. "She could cut and follow blocks like a college football player," says her coach, Chris Staib. Staib hatched a plan: His team was drafting seventh out of nine. He wanted to pick the girl. So he started talking her down, suggesting she would get hurt. The other coaches bought it, and with his first selection he chose Sam Gordon. Staib just laughed. Sam ended up running for 25 touchdowns and 10 conversions (no PATs at this level) in her first season playing tackle football. She earned the nickname "Sweet Feet" – a modern-day Rudy Huxtable – and a breathtaking viral video in which she looks so fast that you have to wonder if it's real. "Oh it's real," says Staib. "That's her. I was there for all of that." It may be real, but is it appropriate? This is a 9-year-old girl playing against bigger, stronger boys. She even had a trainer who put her through agility drills and plyometrics. Gordon is not even 60 pounds, and there's a kid on her team who weighs more than 150. (His nickname: Tank.) In an era of concussions and frequent ACL tears, it's fair to ask: What are the adults thinking? Sam's dad, Brent, admits his daughter had an adjustment issue at first. "She had a little bit of a struggle," he said Tuesday in a phone interview from his Idaho law office. "The team lost a couple of games. Since she was the primary ball carrier, she felt a lot of pressure to win. She felt blame for losing." His solution was the video, telling Sam not to worry about the end result but rather each play. "Get me some highlights," he told her. He says it helped. And what about the tackling? There are some fairly vicious hits on this video. "I started her out in soccer at 4 years old and we would play out in the yard," Brent explains. "And my son's friends were pretty aggressive and rough. She could really handle a lot of the physical play. There were some games where she'd fall down and just keep going. She would get kicked in the face, kicked in the gut and just keep going." Staib doesn't hesitate when asked about the hitting. He says Sam loves to tackle and even goes after Tank whenever she gets the chance. He's not worried. Brent says only once did Sam get shaken up from a hit. 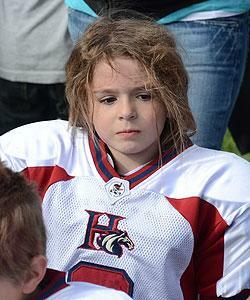 She came out of the game, rested for a few plays, then returned to score a touchdown. "Some kids, right before the contact, they stop," Sam told her father. "I don't. I just hit 'em." "That's not something I taught her," Brent says. A lot of people won't accept a 9-year-old girl playing tackle football, and perhaps with good reason. But it seems Sam loves it. Her dad and coach say she has no hesitation about coming back for another season. And her dad admits he's overwhelmed with pride, even though (or maybe especially because) he was no star athlete. "With Sam, I keep questioning myself," he says. "Am I trying to make it something it's not because I'm her dad? I asked my brother, 'OK, am I just being a crazy dad here? Or is this really cool?' "
Maybe it's a little of one and a lot of the other. But what started as little Sam trying to keep up with her brother is now dozens of older boys trying to keep up with her.